Coconut is a summery plant with so many year-round uses in the kitchen. By now we’ve all heard about the benefits of the healthy fats found in coconut oil and milk. But the ingredients don’t end there: there’s coconut flour, coconut sugar, shredded coconut, and coconut water, just to name a few. All can act as substitutes for staple pantry ingredients or flavor enhancers themselves. Do you often use coconut products in your cooking? What are your favourites? Let us know in the comment section! Coconut flour is a great alternative flour for those looking to avoid grains, gluten, or nuts. Made from dried and ground coconut flesh, it’s high in fiber and full of healthy fats. Look for it at health food stores or order it online. Fresh coconut flour should smell slightly sweet and nutty. Like other alternative flours, it has a higher fat content, making it easier for the flour to go bad. Our tip: Purchase only as much as you need and store in an airtight container in the refrigerator (or better still, the freezer). This way your coconut flour should keep for a year. Flour that has gone bad will have a bitter smell and taste. Due to the high fiber content, coconut flour cannot be equally substituted for wheat flour in baking. Instead use approx. 28 g ( ¼ cup) to 45 g (⅓ cup) coconut flour for every 125 g (1 cup) of wheat flour. Baked goods made solely with coconut flour can be dense since the coconut absorbs most of the liquid. Our tip is to use a combination of flours or add 60 ml (¼ cup) extra liquid in order to prevent a heavy, overly dry finished product. This Paleo Banana Cake with Walnuts is a tasty example. Like coconut flour and oil, coconut milk is another creative distillation of coconut flesh. Shredded pieces of coconut are boiled until their liquid is extracted. The pieces are strained and what’s left is a thicker cream layer and a thinner milk layer. Coconut milk is typically sold in both cans and cartons. For cooking and baking, use a can, as they contain the true richness and body of coconut milk (like in this Dal Soup). Carton coconut has been diluted with water, making it a better alternative for making drinks or splashing into coffee. There are two main types of coconut oil, unrefined and refined. Unrefined (also known as virgin or pure) coconut oil has been distilled directly from coconut meat and gone through little processing. The flavor is distinctly sweet and coconutty. 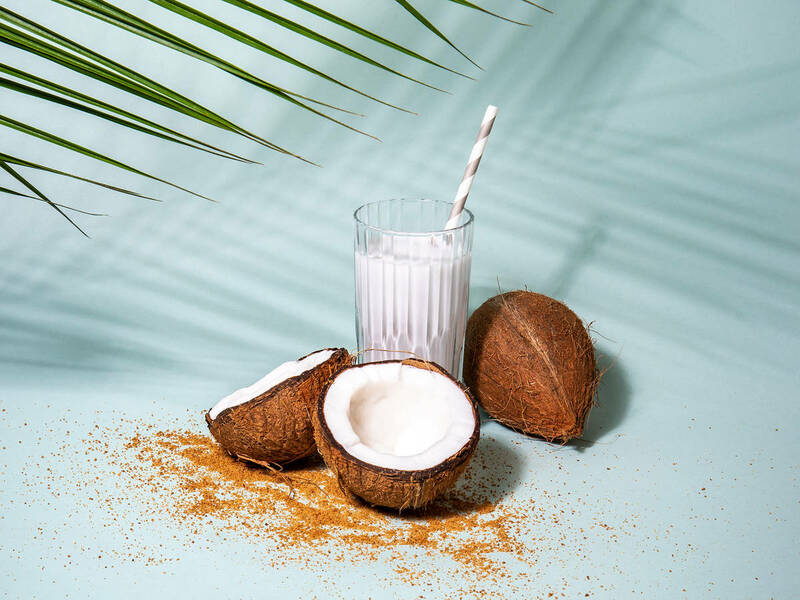 Refined coconut oil has been distilled from the dried coconut flesh and been processed more, removing most of the coconut flavour and leaving a relatively neutral tasting oil behind. Some processing of refined coconut oils may use harsh bleaching or deodorizing chemicals, so always read the label first. Store coconut oil in a dark, cool place, away from any heat source, like your stovetop or oven. Properly stored oil should last 2 years. Rancid oil will change color or smell ‘off’. Coconut oil becomes solid at temperatures lower than 25°C (77°F) and liquid at temperatures higher than this. When solid, coconut oil is a perfect substitute for butter and can be substituted equally for any other fat in baking recipes. Try out this tender Zucchini Lime Cake that substitutes coconut oil for a denser, moister, altogether richer cake. It is also an excellent alternative oil for frying as refined coconut oil has high smoke point. Coconut sugar is made by boiling the sap of the coconut palm. It has a dark, caramel flavor, similar to molasses. Some consider it a better alternative to table sugar because of its lower glycaemic impact (meaning it doesn’t cause as much of a sugar high and crash as other foods) and high potassium content. You can find it at most health foods store or online. Coconut sugar can be substituted equally for white sugar, though due to its rich molasses-like flavour, we suggest using it in recipes like these Speculaas cookies. Shredded, or desiccated, coconut is, exactly as its name suggests, made of dried, shredded coconut flesh. The only difference between the two is that shredded coconut has longer, plumper strands, while desiccated coconut is much finer. Both are creamy, nutty, and slightly sweet—firm favorites for baking. Beyond flavor, their addition adds texture to macaroons, and looks great for presentation, like in these Glazed Coconut-Lemon Cupcakes. But it doesn’t stop at sweets, shredded and desiccated coconut can also be sprinkled onto porridge or curries, added to smoothies and used as a crust—try this Coconut Crusted Cod. This refreshing drink comes straight out of the coconut when cracked open. Natural coconut water should be slightly sweet and is a good source of electrolytes like potassium and sodium. Because of this, many brands have added flavors or sugars to the water so that it can be consumed as a beverage, rather than an ingredient. If you are baking or adding it to your smoothies (like this delicious post-workout smoothie) look for a coconut water with as few adulterants as possible. Like any beverage, it can be stored unopened in a cupboard and must be refrigerated upon opening. Is Fresh Really Better Than Frozen or Canned?